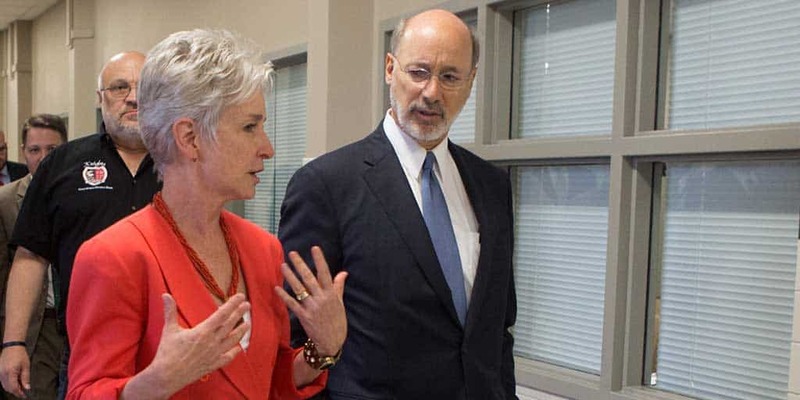 Harrisburg, PA – Governor Tom Wolf announced today that Pennsylvania has received a nearly $5 million federal grant to provide career services, with a plan to return to work and create a mobile app for individuals impacted by the opioid epidemic, as part of the administration’s comprehensive prevention, rescue and treatment efforts. Central Pennsylvania Workforce Development Corp., which represents Centre, Clinton, Columbia, Lycoming, Mifflin, Montour, Northumberland, Snyder and Union counties, will receive a $1.1 million award. Philadelphia Works, Inc., which represents Philadelphia County, will receive a $2 million award. Washington Greene County Job Training Agency, Inc., which represents Beaver, Greene, and Washington counties, will receive a $411,400 award. Westmoreland/Fayette Workforce Investment Board, which represents Westmoreland and Fayette counties, will receive a nearly $472,600 award. Connect PA CareerLink® employment services to PA Centers of Excellence. L&I will work with partners to provide mobile career services outside the PA CareerLink® brick-and-mortar centers. Participants will also be provided with a transferable skills analysis, soft skills curriculum, and targeted training opportunities. Substance use education training will also be available to CareerLink® staff to help them better understand how to work with participants and businesses affected by the opioid epidemic. Develop a mobile app to link people to workforce and support resources. L&I was awarded $700,000 to create the “Community Resource Pocket Navigator” app. The app will be an intuitive, user-friendly, “one-stop” directory to guide individuals to the services they need – whether it’s support services once an individual leaves a medical or treatment facility or employment services from a local CareerLink® office. The app will be available in English or Spanish and will include a first point of contact providing phone numbers, websites, and more. Increase the number of Certified Recovery Specialists and provide additional training to retain existing specialists. LWDBs will work with education and training providers to recruit, train and place Certified Recovery Specialists to meet local needs. Additional training will be provided to existing Certified Recovery Specialists. These specialists are people who have undergone the treatment and recovery process and offer crucial peer support, which is a component of successful recovery. Engage employers in Recovery Friendly Workplace initiatives. LWDBs will engage employers in initiatives that support individuals in recovery in the hopes of increasing workplace productivity and reducing health care costs while creating supportive environments for workers. Participating employers will be willing to hire and work with people in recovery. For more information about the Wolf Administration’s response to the opioid crisis, visit www.pa.gov/opioids.